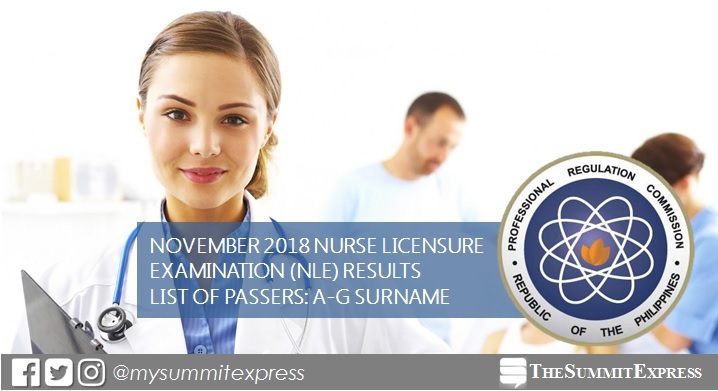 MANILA, Philippines – The November 2018 nursing board exam (NLE) results are released online on Friday, December 7, 2018 or in 14 working days after the exam. The Professional Regulation Commission (PRC) conducted the NLE on November 17 and 18, 2018 in Manila, all regional offices nationwide (Baguio, Cagayan De Oro, Cebu, Davao, Iloilo, Legazpi, Lucena, Pagadian, Tacloban, Tuguegarao) and Zamboanga. The list of passers in alphabetical order (A-G) surname is available here as officially out online. According to PRC Resolution No. 2017-1068, the target release of results of recent NLEis on Friday, December 7, 2018 or in just 14 working days after the last day of exam. We advise examinees to monitor announcement of results starting Monday, November 3.